Welcome to another recurve review, this time of the Bear Archery Youth Flash. 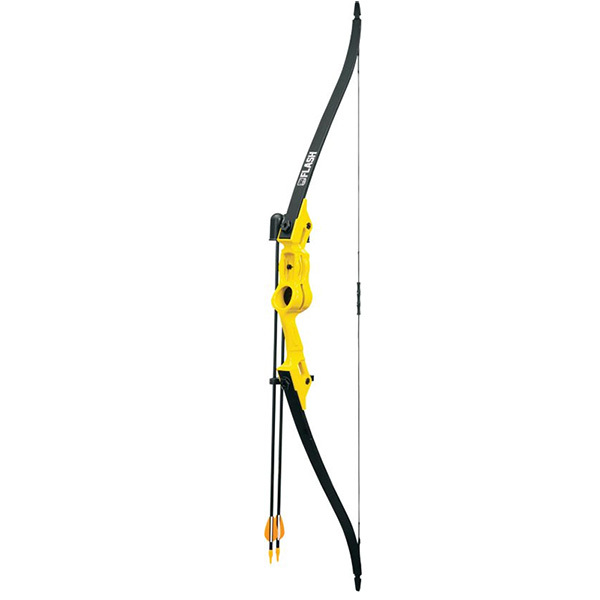 This particular bow is available with either a red or yellow riser, and is perfectly set up for a young archer to get started with the sport. 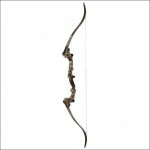 This recurve is designed for the five- to ten-year-old crowd, with a short pull length and low draw weight. Let’s take a look and see how it fares, eh? You won’t find a bowstringer, unfortunately. You don’t absolutely need the accessory, but even with such a low-powered bow it’s better to string the bow with it than not. Plus, it would give your budding young archer the experience of stringing and unstringing his or her bow the right way, using the correct tools. 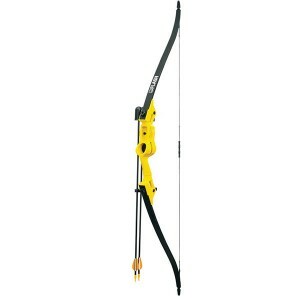 When you purchase the Bear Archery Youth Flash Recurve Bow, it’s already assembled and almost ready to go. It’s a takedown, with easy to twist thumb bolts for removing and reattaching the limbs. The brace height is set at seven inches, and the quiver attaches easily to the riser. Installing the sight pin is equally easy. What Accessories Can I Use With The Flash? You won’t find any way for using extra bells and whistles with this particular recurve, but it does include a Trophy Ridge whisker biscuit arrow rest built into the riser, along with a sight pin. Bear in mind, this particular bow is designed for young children, so it’s important to keep things as simple as possible. You won’t have to do much to the bow, but you should still take a gander at our guide to tuning a recurve bow for the best way to set up your child’s equipment. Is The Flash Accurate And Powerful? This particular recurve is almost a toy, so it isn’t very powerful. The draw weight is adjustable between five and 18 pounds, so there won’t be a whole lot of power behind the arrows when your young one takes his or her shot. If you want to know how heavy you should set the bow, check out ourguide on selecting the right draw weight . Accuracy is surprisingly good, and my nephew was quickly shooting 3-inch groupings from 25 yards. It’s not a competition bow, to be sure, but it’s great for getting your child or young friend started in the sport. Absolutely not! With a maximum draw weight of just 18 pounds, the Flash is not hunter-friendly. This recurve is designed for beginning target practice, nothing more. Will Beginners Be Able To Learn With The Bear Archery Youth Flash? Young beginning archers will find the Flash quite forgiving of their inexperience, and will love the experience of shooting arrows and seeing them go where they want. The Trophy Ridge whisker biscuit arrow rest keeps the arrow in place for hassle-free shooting, and the included armguard and finger rollers allow your archer to enjoy the sport without getting hurt. 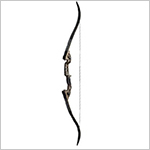 The two included Safetyglass arrows are the best to use with the bow, but you may want to purchase more arrows. Since arrow selection is a complicated thing, be sure to check out our guide on arrow selection before you go shopping for more arrows. Bear Archery has built the Flash to stand up to just about anything a youngster can do, so the riser is constructed of very durable plastic. The limbs are equally well-constructed for durability, so this recurve bow should last until your beginning archer outgrows it. Just make sure to take down the bow between uses to prevent limb twist. This simple, beginner’s bow shouldn’t be used with heavy strings. The string that comes with the recurve is what you should use, so don’t go shopping for a replacement. The included string is well-made, and should last quite a while. With the low price of this model, you can’t expect to get a lot of performance out of it by changing strings, so just go with what it comes with. I’m estimating the weight of this particular bow at under a pound and a half. It’s very lightweight, as it should be for young archers. It holds easily in the hand, and the ambidextrous riser is perfect for either left- or right-handed shooters. This is a young person’s bow, without much power behind it, so it’s not very loud. You can definitely hear the “thwack” of the string, but that’s to be expected (and honestly, it’s what the kids want!) If you are worried about the noise, you can always put on string silencers, but that would just kill half the fun. Thanks for reading my review of Bear Archery’s Youth Flash Recurve. This is the perfect set for a beginning archer, and you can definitely get your young ones started off on the right foot with this purchase. 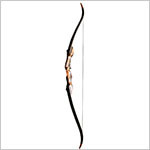 Take a look at current price on the Bear Archery Youth Flash Recurve Bow if you’re interested in buying.